Ice sculptures for food decoration are the perfect idea to glamorize your wedding reception. Have a look at the following 5 ideas that are easy to implement and visually very pleasant too. We also present suggestions on how these ideas can be suitably incorporated in food presentation. Besides serving the aesthetic purpose, this will also help keep your food and drinks at an ideal cool temperature. It’s best to use these sculptures in cold weather or air conditioned interiors. A majestic figure of art carved out of ice gives the essential exotic element to your food tables. Place them on the table serving drinks or cold food items like salads and pudding. A luge is a perfect thing to add glamour to your cocktail party. For an informal do, guests can enjoy drinking directly from the luge; and when putting up a formal cocktail event, you can have glasses filled through the luge and then served to the guests. Perfect for salads, or better still, on the table serving cold fish. The structure looks cool and inviting. Having it on your serving table would make your party look really stylish. A sailboat ice sculpture looks perfectly harmonious besides the wedding cake. A major focus of your party is going to be on the cake, and therefore, it makes sense to adorn the area with an exquisite ice sculpture of the sailboat. Salads and cold pastas are usually served on tables different from the other buffet items. These tables are best suited for ice sculptures, since they don’t have any hot items that may contribute to the sculpture melting faster. A large sailboat and food items displayed inside it: the idea is going to make your venue look unique and chic! This one is just wow! A pleasant change from the usual shapes, the clam shell can be solely decorative, or it can serve a function, depending on your space and preferences. Serving salads through ice sculptures is always a great idea for wedding receptions or other events. A clam shell makes for a comfortable way to display and serve salads, owing to its open design. The fruits, vegetables and pastas you display in your shell also remain fresh for a long time in the ideal low temperature of the ice. People can pick up their chocolates through the mesmerizing clam shell of ice. Part of the shell in color can look magically tempting. Choose one color, or many different ones to form a rainbow-like appearance to further beautify your clam shell ice sculpture. Who said you could have multiple tiers only in wedding cakes; now you can even get a similar looking ice sculpture to add quaint charm to your wedding reception décor. An easy way to display and self-serve, salads and other cold items do well on the cascading platforms of an ice cake. Go an extra step at beautifying the sculpture of your ice cake by adding intricate designs to it. You will love the visual effect these details bring out! How romantic and wedding appropriate! Rose petals would make your ice cake irresistibly beautiful. Imagine how exotic it would look if you served ice creams in ice bowls at your wedding. People would remember your event for this novel idea. 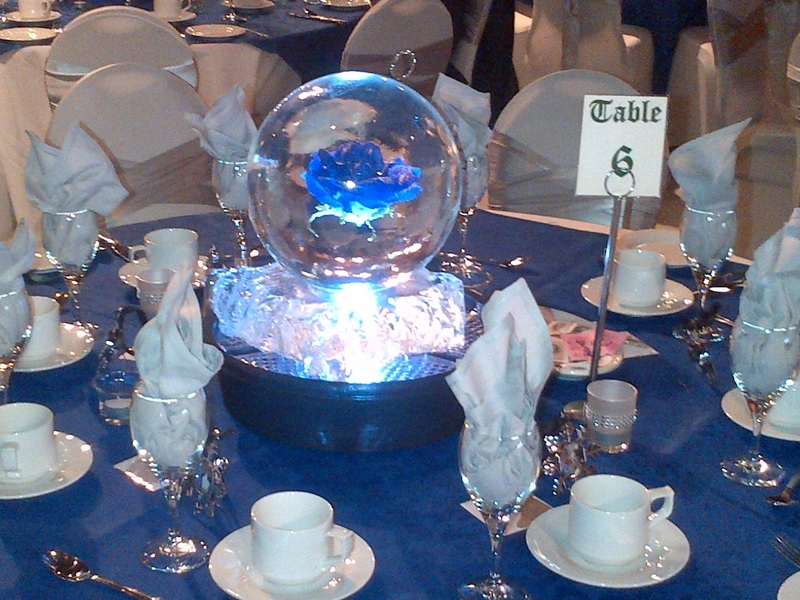 Your ice bowl offers endless possibilities of enhancing aesthetics. You can have frozen flower petals inside the sculpture for a romantic theme and spellbinding beauty. Choose the colors of the flowers to match with the rest of your décor. In addition to small individual ice cream bowls of ice, you can place a huge one containing ice cream on the serving table. The ice cream won’t melt, and the presentation would be impeccable. Salads and ice sculptures are the best of buddies that always get along very well with each other. Get a huge ice bowl made for the purpose of displaying salads – this would be a most practicable idea to incorporate at your wedding reception.